Happy spring! We've got a long weekend on our hands and a salad for dinner is in order. We love eating salads on the weekend especially because we like to take the time to collaborate with fresh and exciting ingredients from the market. But they never feel like they're "healthy" or boring. They're always full of flavor and texture and a true celebration of veg. 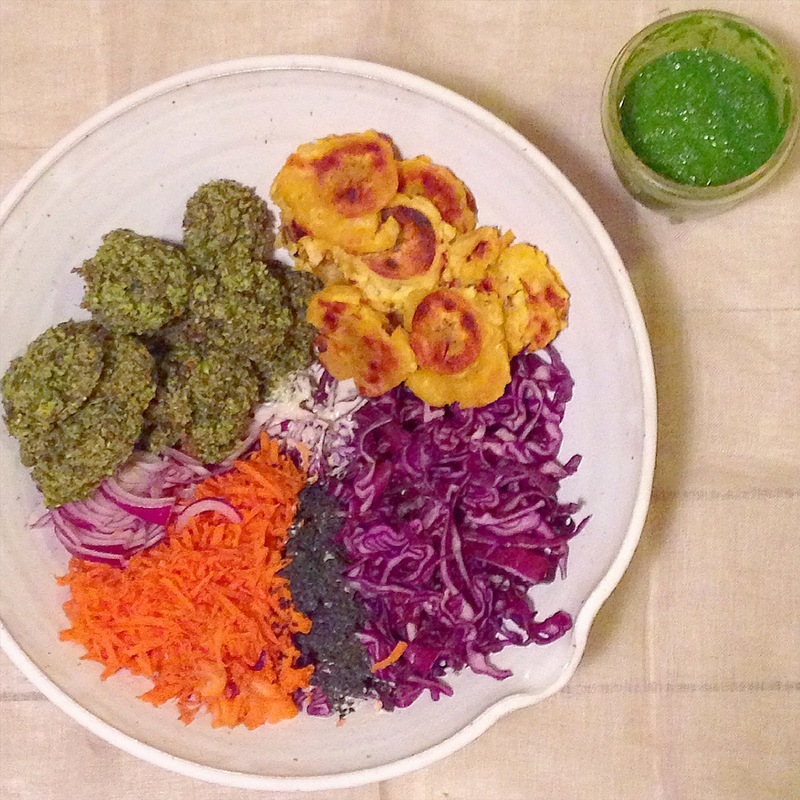 This time we went for tostones with chimichurri sauce along with a salad of red cabbage, carrot, onions, black sesame seeds and baked green chickpea falafel with a lemon tahini dressing. A really satisfying meal that really felt like a treat. I discovered plantains while living in Miami but we only ever ate the ripe sweet kind. When I moved to New York City, I rediscovered plantains, this time savory instead of sweet, and enjoyed them with chimichurri sauce. Now that they regularly sell plantains at the Indian store here in Stockholm, I've become better acquainted with these tropical beauties. I buy them when they're green and allow them to darken on the counter, much like a banana, until they ripen a bit. The idea is not to blacken it completely, but to allow leopard spots to appear so that it's slightly on the sweeter, more tender side, rather than the starchy green plantain. If you blacken it completely, then it will taste very sweet. It's actually up to you to see how you want to eat it. I like the ripeness somewhere in the middle -- between sweet and starchy. Tostones are twice cooked. First they're fried in two-inch pieces, then they're flattened and fried again. I like to pan-fry them to reduce the greasy factor. Nonetheless, they're a quick, easy, delicious crispy treat especially when dipped in chimichurri sauce (also similiar to a mojo) -- a fresh, tangy sauce that can be used on vegetables or even as a salad dressing. It's sort of a nut-less pesto made of parsley and red wine vinegar but I like to add fresh coriander as well. Once you make it and see how easy it is, you'll become addicted! 1. Peel the plantains and slice into 2 inch slices. Heat a cast iron pan with 1 1/2 tablespoons coconut oil and fry until golden on both sides on medium heat. Take off the heat and smash each plantain with a wooden spoon or heavy pan and fry again in another 1 1/2 tablespoons of coconut oil until further golden on both sides. Sprinkle with salt. Drain on paper towel. 2. In a blender, blend all the ingredients and taste for salt. Transfer to a bowl. 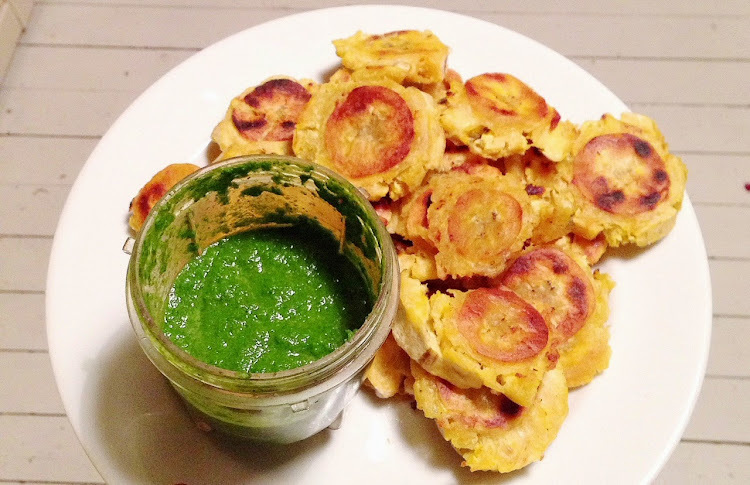 Dip the warm tostones into the chimichurri sauce and devour immediately! Enjoy! Hi Fayder, thank you so much for reading! The Indian store Taj Mahal is located at Kammarkargatan 40 around Hötorget, just off of Drottninggatan, hope that helps!